We’ve got a mini heatwave going on which is lovely after such a harsh winter. Lots has been going on in our garden including a new greenhouse so I’m hoping for a good crop of tomatoes and want to make vast batches of pasata to bottle up for the winter. . Both knitting and sewing has been taking place as well but photos are bottle-necked at the processing department so my phone will have to suffice. I’ve also finally got some good news about my knee as I’m seeing another Physio and have started work in the gym. I can’t wait to get rid of my limp! >Don't let it get out, but spring might be here, too. It's supposed to get up to 60+F today, but still chilly right now. We have a new dog around here, Magic is a rescued 2 yo heeler mix. Today we started training her on the invisible fence. Good to hear that your knee is finally improving some. 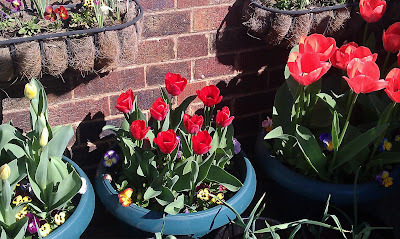 >Lovely flowers, so cheerful in the sunshine. We have had some really nice weather too but sadly I don't think it is set to last here – oh well, lets hope the forecast is wrong. >Your tulips are looking beautiful! « >What would you make?